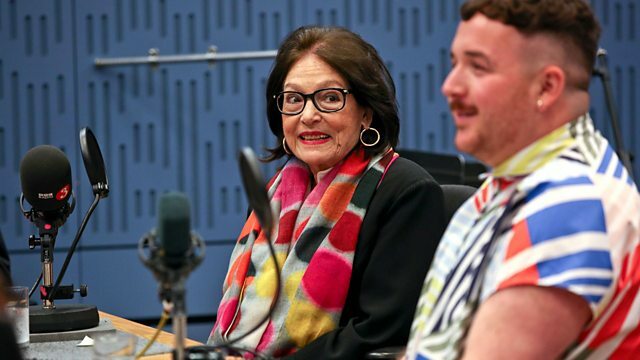 Clive Anderson and Scottee are joined by Nana Mouskouri, Sam Claflin, Dean Atta and Sindhu Vee for an eclectic mix of conversation, music and comedy. With music from Kathryn Joseph and XamVolo. Nana Mouskouri celebrates 60 years in music with a special concert at London’s Royal Festival Hall on 17th October. 'Sandhog' runs at Pleasance Courtyard. Edinburgh from 1st to 26th August. 'Adrift' is in UK cinemas from 29th June. 'A Damn Fine Spectacle' EP is available now on Decca. XamVolo is playing at London's Underbelly Festival, Southbank on Sunday 24th June, Sunday 1st and 8th July. ‘From When I Wake The Want Is' is available on 10th August on Rock Action Records. Kathryn is playing at O2 Academy, Glasgow on Monday, Barclaycard British Summertime, London on 7th and The Tunnels, Aberdeen on 17th July. Check her website for further dates.